From the desk of an Environmental Scientist. It was bulk trash pick-up in my neighborhood a couple weeks ago, and I really started noticing the things people throw away. Everything from toys, flower pots, electronics, furniture, building materials and the list goes on… It struck me how many resources (labor, money, natural resources) went into creating an item that now sits on a curb to live forever at a landfill. It made me think about how much I throw away versus trying to reuse an item in a different way. On my daily dog walk, I noticed some scrap wood piled up on the curb at a house just around the corner and had a great idea about using it to display my house numbers. A side note, I’ve lived in my house 9 years and have never put up house numbers. It’s the project that never happens. The wood had a cool patina and would have made an excellent canvas for my modern house numbers. Every day I would pass it and think the same thought. I think of myself as a pretty good re-user of materials. I used salvaged granite and wood for my kitchen remodel. Most of my furniture was purchased used. I’m always searching Craig’s list. But I never took the 10 minutes needed to pick up the wood and then it was gone. It was hauled off. That happened weeks ago and I’m still thinking about it. It makes me wonder why I didn’t go get it. Was it because it was free? In front of someone’s house as trash in my neighborhood? I’ve paid for my other “salvaged” treasures; does it make a difference if someone else sees value in an item? What makes a material valuable? These are the questions I’ve been pondering. Some deep thinking I’m passing along. 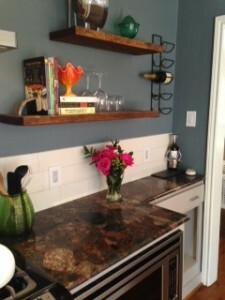 In the photo on the left, the wooden shelves are reclaimed along with the granite countertops. The photo on the right are all fabulous finds and all salvaged. If you have questions on how to go about getting salvaged products or materials comment on this post or email with your questions. 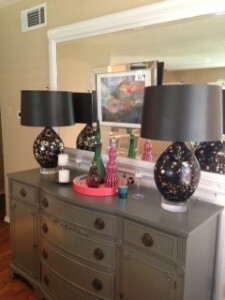 And please share your favorite salvaged finds!